Kharbuja rasayana recipe - Kharbuja rasayana is a delicious all season dessert, commonly made in Karnataka. 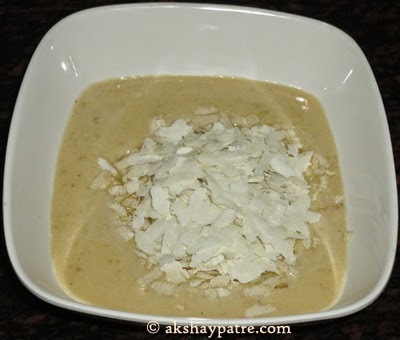 Muskmelon in combination with coconut milk make this dish an extremely pleasing dessert when sweetened with jaggery and induced with cardamom flavor. Traditionally, coconut paste is used to make the rasayana. But somehow, we like to have it in coconut milk rather than coconut paste. 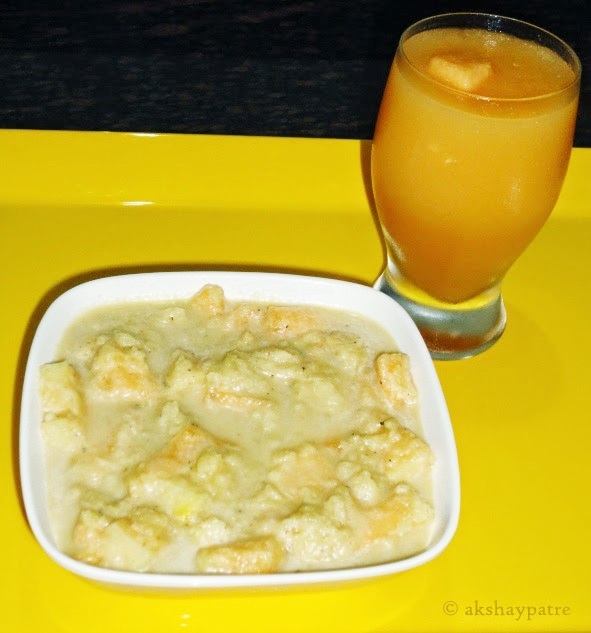 Muskmelon, mango, banana and mashmelon (chibud) are most popular fruits to prepare this dessert. Muskmelon and chibud belong to the same melon family. Both have soft flesh with distinctive melon flavor. 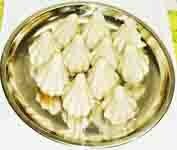 This kharbuja rasayana is alternative to chibud rasayana. I don't get chibud here. Chibuds are extensively cultivated in coastal parts of India. Both kharbuj and chibud are delicious fruits having a property for keeping the stomach cool. In this dish, jaggery and coconut milk are team players. They both goes great in combination with muskmelon. The beaten rice ( poha) is immersed in the sweetened coconut milk to give a unique taste and texture to the rasayana. Then muskmelon pieces are added and induced with cardamom flavor. Even you can grind half of the muskmelon in a mixer before adding it to the coconut milk. 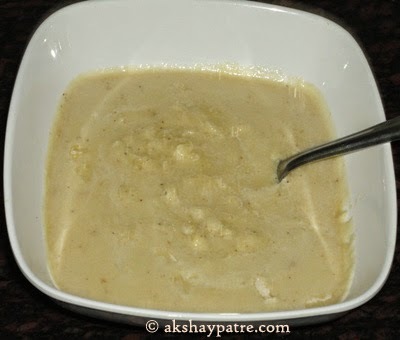 I make this rasayana specially on warm days. To prepare a delectable rasayana, make sure to buy an oval shaped luscious muskmelon which has a distinctive characteristic taste. There are many versions of traditional rasyana. All versions are so tasty. 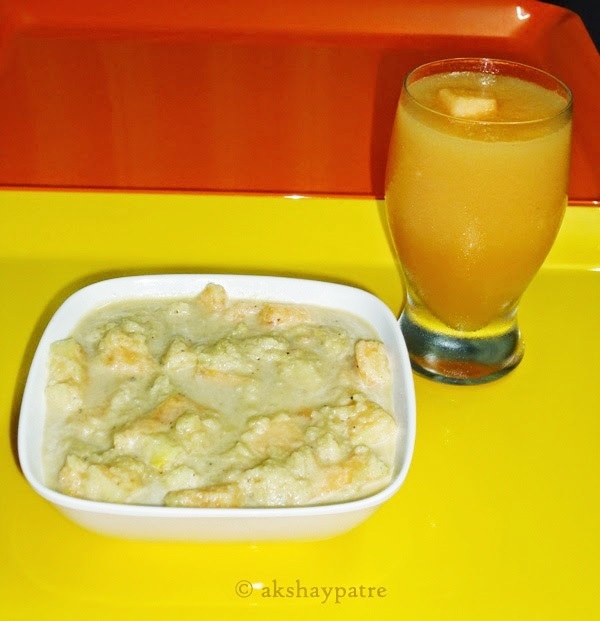 Rasayana prepared in combination with muskmelon and banana, mango and banana, muskmelon and mango are such a great dish to serve. Serve this delicious rasayana as a dessert. It can be eaten as it is. It also goes well with pooris. Either way, this dish is fantastic. Cut the muskmelon and remove the seeds. Peel and chop them into small pieces. Keep the chopped muskmelon in the refrigerator for about an hour. Grind the grated fresh coconut with 1/2 cup drinking water to a very smooth paste. Pour the paste in a stainless steel strainer and extract thick coconut milk. 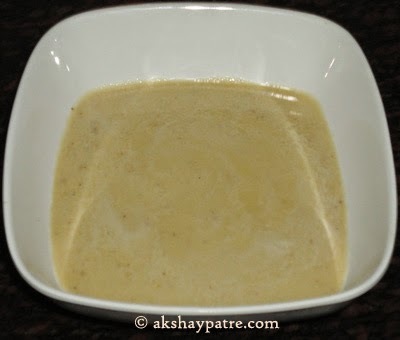 Add the jaggery in the coconut milk and dissolve it with a spoon. Then add the poha and immerse it. Add the chilled muskmelon pieces. Add the cardamom powder. Slightly mash the muskmelon pieces with a spoon and mix gently. Serve the kharbuja rasayana chilled. It can be eaten as it is. Rasayana goes well with pooris. 1. Cut the muskmelon and remove the seeds. Peel and chop them into small pieces. Keep the chopped muskmelon in the refrigerator for about an hour. 2. Grind the grated fresh coconut with 1/2 cup drinking water to a very smooth paste. Pour the paste in a stainless steel strainer and extract thick coconut milk. 3. 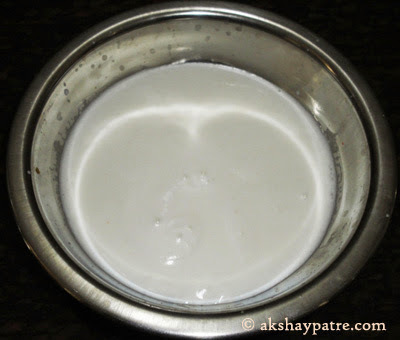 Add the jaggery in the coconut milk and dissolve it with a spoon. 4. Then add the poha and immerse it. 6. 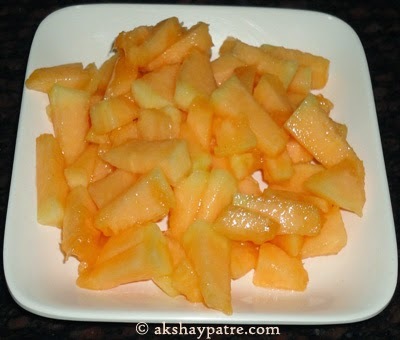 Add the chilled muskmelon pieces. Add the cardamom powder. Slightly mash the muskmelon pieces with a spoon and mix gently. Serve the kharbuja rasayana chilled. It can be eaten as it is. Rasayana goes well with pooris.